The Dunes Community Development District (DCDD) was created in 1985 to finance and manage major infrastructure facilities and services associated with the development in the District service area. The DCDD is responsible for potable water and wastewater utilities, distribution of reclaimed water for irrigation, storm water management for the community, operations financing and maintenance of the Hammock Dunes Toll Bridge. The DCDD service area is approximately 2,200 acres and is located within the unincorporated land of Flagler County. 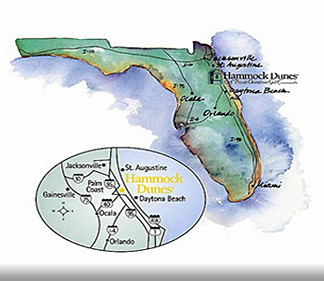 The DCDD serves the private communities of Hammock Dunes, Ocean Hammock, Hammock Beach, and Yacht Harbor Village. Visit the DCDD site at http://dunescdd.org/ for additional details. The DCDD provides potable water for household use to all residences and non-residential facilities in the District service area (reclaimed water is used for irrigation). DCDD was awarded a grant from St. Johns River Water Management District for $2,800,000, the maximum grant available. These funds paid 40% of the total construction cost of the Dunes CDD’s new Reverse Osmosis water treatment plant, which went into operation on August 15, 2007. 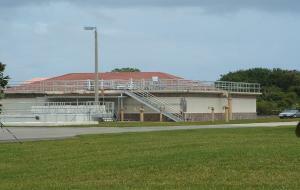 This new facility produces high quality drinking water that is significantly clearer than the water that was previously received from Palm Coast. 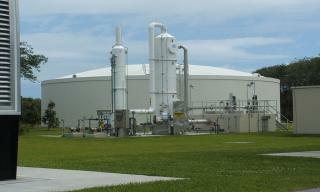 The new plant utilizes chlorine rather than chloramines for the disinfection process. The use of chlorine, which is a stronger disinfectant than chloramines, allows for greater process control and flexibility. The change in disinfectant does not cause adverse health effects. Wastewater is collected and conveyed by a series of pump stations to the District wastewater treatment plant. 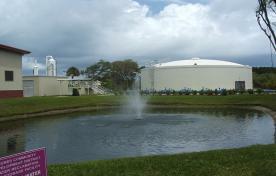 In addition to its obvious role, the wastewater plant also contributes to water conservation. The multi-stage, advanced secondary treatment process produces reclaimed water that is used for irrigation of golf courses, area road rights-of way and residences within the community. The DCDD’s Stormwater Management System consists of a series of interconnected lakes, marshes and wetlands. These facilities serve the dual function of managing (retaining) stormwater runoff and recharging the shallow ground water aquifer in the area. Although additional treatment plant capacity is not needed at this time, a recently completed capacity analysis report identified the need to begin planning and design of the water plant expansion. As a result, DCDD has contracted with McKim and Creed consulting engineers to design the future expansion of the water treatment plant which will increase its capacity from its current 0.72 million gallons per day to 1.44 million gallons per day. The design is approximately 60% complete and the engineer expects to complete the design early next year. In 2013, DCDD constructed additional well capacity to provide adequate supply of water for the expanded plant, and anticipates starting construction in 2014, with completion in the spring of 2015. The expanded plant will utilize alternative, brackish groundwater as the primary source of water. The total estimated construction cost is $2,255,000. However, the St. Johns River Water Management District awarded DCDD a grant for 40% of the construction cost of the water plant expansion project. The DCDD’s share of the project cost of $1,353,000 is to be paid from financial reserves set aside for this purpose. When placed into operation, this project will provide a reliable, sustainable supply of drinking water for the potential expansion of the DCDD communities. The Hammock Dunes Bridge, completed in 1988, provides DCDD residents with convenient access to Palm Coast and Interstate 95. With a five foot walkway separated from traffic by a concrete barrier, the bridge is often used for biking, jogging, and walking. The 65-foot high bridge also serves the more critical purpose of providing direct accessibility to areas east of the Intracoastal Waterway for emergency services vehicles and emergency evacuation route for barrier island residents. 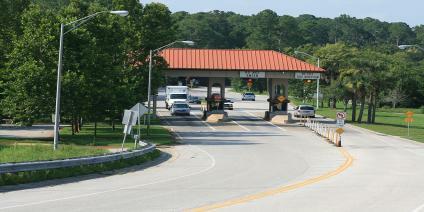 Bridge construction was funded by revenue bonds totaling approximately $16.3 million. No tax monies were used. The bond documents require the District to collect tolls and set rates and fees sufficient to meet the financial obligations of the bonds and normal operating and maintenance expenses. With the December 2011 DCDD-Admiral Corporation-Flagler County termination of the Hammock Dunes Development of Regional Impact (DRI), DCDD is no longer required to build a second bridge span, thus ensuring a low traffic density, maximum 2-lane “residential” approach to Hammock Dunes and the other DCDD supported communities. 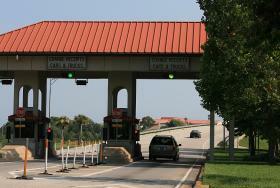 The elimination of a future expansion of the Hammock Dunes also allowed the DCDD to approve a 43% reduction in the Prepaid Discount Toll Schedule effective October 1, 2012. The determined this additional reduction could be accomplished while still providing for long term maintenance and repair costs to insure this critical transportation link is kept in top condition.